Whitefield protest on Nov 30th; Citizens bat for Justice Adi; Repair cafe; Did Rahul Gandhi really get stumped? There is no disconnect between you as a citizen and the content we publish on Citizen Matters. We’re part of your community; we’re co-travellers towards a better Bengaluru. Do more than just read, be a stakeholder, make a difference, donate today! To know more about our #EnableChange campaign, visit: oorvani.org.in/support-us. Thousands of citizens in Whitefield will hold a peaceful protest on Monday, November 30th, asking the government to improve the mobility issues in the vicinity. Better roads, footpaths and street lights are the main demands. Read: Whitefield citizens to take to the streets. A concerned citizen asks if corporates will support the protest, by offering a leave on the day for those who want to join? Read: An open letter to corporate heads. Purna Sarkar and Antara Mukherji start a new initiative to give broken household things a new lease of life. Get things fixed, meet people and even learn how to repair stuff at India’s first Repair Cafe on 28th November. Read: If it is broken, fix it! Legislators from the ruling Congress have submitted a petition in the Assembly to remove Uplokayukta Justice Adi, on charges of overstepping jurisdiction. Meanwhile, a group of citizens, rallying in his support, have written to the Chief Minister opposing the move. Read: Dear Chief Minister, do not remove Upalokayukta Justice Subhash Adi. A plot of land near the Indira Nagar Metro station has been vacant for more than 50 years. Here’s what has become of it as a result of negligence. Read: An idle plot is the devil’s dumpyard. BMRCL came under fire from the public and BBMP at a recent public hearing on tree felling for the extension of the metro lines, as it could not provide proper responses to the objections raised. Read: Public hearings on tree felling to be held locally. Deepa Mohan, who was present at the meeting shares her observations. Read: Meeting called by Bangalore Metro, and called off by citizens’ demand. A final year journalism student who attended Rahul Gandhi’s talk at Mount Carmel College calls him inspiring and spirited, and questions why the media has reported otherwise. Read: Did the Mount Carmel students really stump Rahul Gandhi? 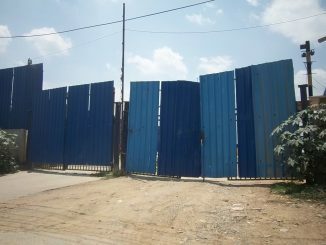 The National Green Tribunal has issued a stay on construction in the area between Kasavanahalli and Kaikondrahalli lakes since it is a sensitive zone. Read: Citizen activists oppose apartment construction near lakes. Halanayakanahalli, off Sarjapur road, like many other parts of the city, depends on groundwater for water needs. Karnataka State Natural Disaster Monitoring Center put up a weather station at the Gram Panchayat office to track rainfall data in the area. Read: How much it rained in Halanayakanahalli. Enfold is organising a panel discussion with experts on child safety to discuss the recommended protocols for schools as per the CPP and POCSO Act. The discussion will be held on November 28th at Lawrence School, HSR Layout. Naziah is one of the workers working at a plastic recycling unit in Nayandahalli. Though life hasn’t been very kind to her, she has managed to sail on. Read her story: Naziya, the waste sorter. Yesterday was Karthikai Deepam, a festival celebrated by Tamilians. Here are some snapshots from the festival at a Mariamma temple in Indira Nagar. See: Karthikai Deepam. What happens to all the tyres that are of no use anymore? Rakesh Ayilliath has some suggestions. See: The end of the journey. BLF, India’s second largest literary conclave, will be held on December 5th and 6th. Themes for this edition include the growing intolerance in the country, and the refashioning of historical characters, among others. Read: City gears up for Bangalore Literature Festival. Music from Kannada films continue to be very popular, and much of the credit has to go to music directors who continue to innovate, by combining elements of classical music with what the masses want. Read: Ragas in Kannada movie songs. Imagine a music festival only for instruments? Deepa Mohan who attended the Instrumental Music Festival shares her a report. Real estate developer, Manyata Promoters has topped the list of tax defaulters in BBMP. The BBMP released the list of top 10 property tax defaulters in the city this week. Manyata owes a due of Rs 83.45 crore. In an alarming development, state-run Vani Vilas Hospital for Women and Children recorded the death of eight women post-delivery, in a span of ten days. All the women had delivered babies through lower segment caesarean section (LSCS). The deaths are suspected to have occurred due to an infection spread in the operation theatre. A study carried out by researchers at the Indian Institute of Science has revealed that vegetation and water bodies in Bengaluru city reduced from 62 per cent to 85 per cent between 2000 and 2014, due to fast urbanisation. The study was conducted using remote sensing data. A police sub inspector Gopalakrishna who was on duty at Gali Anjaneya Circle was well-appreciated after he took an initiative to help a pregnant woman deliver her baby on a footpath. The woman from Tamil Nadu was in labour, seeing which the sub inspector, along with sanitation workers, made space for the delivery of child. Starting from next month, vehicles will be barred from entering Commercial Street on the second Sunday of every month. Watch 2 automnes 3 hivers, a movie about the lives of three people over the course of two autumns and three winters at Alliance Francaise on November 26th. Take your children to watch How Cow Now Cow, a play about a grumpy cow at Atta Galatta on November 26th and 27th. Attend The road, my bike and me, a talk by Supriya BS on her travels on the road less travelled at Urban Solace on November 28th. Explore Avenue Road and all that it has to offer at the Pettah walk on November 28th. Join naturalist Deepa Mohan at a Nature walk in Lalbagh on November 29th. The 9th International Biennial for Moving Image Art in India, Experimenta 2015 is happening at Goethe Institute and will be on until November 29th. Drop in to the United Theological College for the sixth edition of The Handmade Collective, to view and purchase works by over 80 craftspersons from across India. It starts on December 2nd. View (in)verto, an exhibition featuring the work of artist Siddharth Sadashiv at Alliance Francaise. The exhibition is on display till December 3rd.